Recorded at Bill Graham's Winterland Ballroom in 1977, this early show from .38 Special shows the band at its rawest, before they adopted a slick, FM-friendly sound after 1982. This show mostly features material from the band's debut A&M release, including "Fly Away," "Tell Everybody," "Just Wanna Rock & Roll," and "Gypsy Belle." The material is not as catchy or memorable as the material that came starting four years later, but they do have the distinct sound that .38 Special has always been known for. The highlight with this show, and the King Biscuit Flower Hour show from June 1977 (also available at Wolfgang's Vault) is the band's hyper-charged remake of Chuck Berry's "Around and Around." .38 Special came to national recognition just as the Lynyrd Skynyrd empire was about to come to an abrupt end due to an untimely plane crash in 1977. Donnie Van Zant, younger brother of Skynyrd vocalist Ronnie Van Zant, along with guitarists Jeff Carlisi and Don Barnes, formed the group in 1975. They failed to gain any real attention until they re-shaped their Southern fried boogie sound into a more radio-friendly AOR format. By the turn of the decade, the songs were more structured and driven by hooky hit choruses, which made them immediately more accessible to FM programmers. The group had not yet hit pay dirt as of this time, with the string of radio hits that included "Hold On Loosely," "Rockin' Into the Night," and "Caught Up in You." That success would come after in 1978, when the band scored big with its Special Delivery album and subsequent releases. They were showcasing material from their 1977 debut when this show was recorded. There is a healthy dose of southern rock boogie featured here, and it is clear that the band had the musical chops to make a real impact in this genre of music. The group built itself around a similar musical line-up as the Allman Brothers (2 lead guitarists; 2 drummers) sans the gritty organ. Musically, the focus has always been on the duel lead work of Carlisi and Barnes. Following a format that blended Southern rock with a rock-oriented country sound, the band had carved a niche spot on FM play lists that embraced the well-polished production value of .38 Special's recordings. It was expected that .38 Special, with the younger Van Zant at the helm, would inherit the Skynyrd legacy, but that never quite happened because the band eventually placed its emphasis on having a slick arena-rock sound. 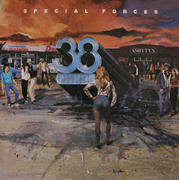 After the mid-1980s, it seemed as though .38 Special had run its course as chart toppers. The band dropped in popularity and failed to re-capture its early '80s hit-making magic. They have, however, remained a solid touring act, and continue to work all year long.